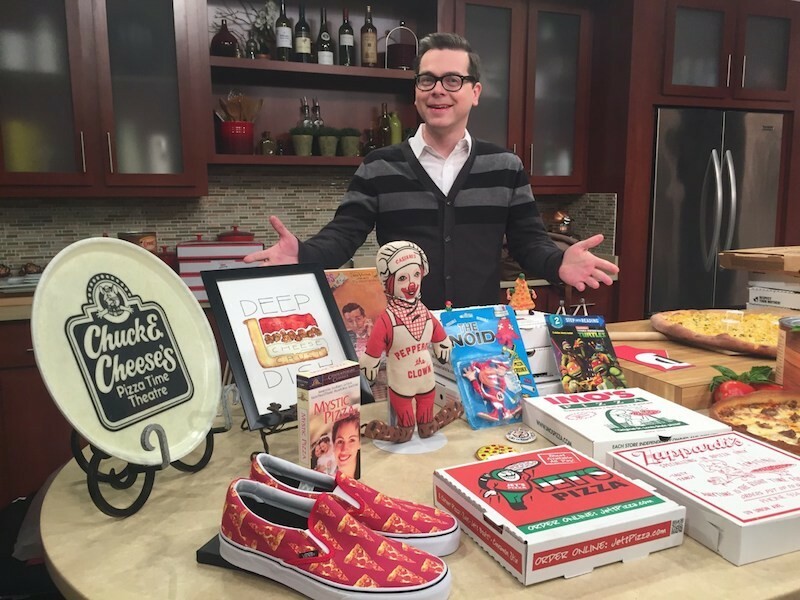 U.S. Pizza Museum founder Kendall Bruns with items from the museum’s collection, which, yes, include an Imo's box. The first thing you probably want to know about the U.S. Pizza Museum, which opened last Friday in Chicago, is if it’s truly national, or if it’s just a propaganda tool for deep dish. The subtext is: Does this museum recognize other styles of pizza, like, say, St. Louis? Yes! Yes it does! St. Louis has its own entry on the list of regional pizzas, right along with Sicilian, Neapolitan, Detroit and Quad Cities, and there’s an Imo’s box on the pizza wall of fame. Provel is mentioned, but not in a derogatory manner. It’s legit. Kendall Bruns, the museum’s owner and proprietor, is that rare creature, a pizza agnostic. As a child, he was a picky eater, and the only food that consistently made him happy was pizza. His dad was in the U.S. Air Force and the family moved often, so he didn’t have a chance to become attached to one particular style. He loves and appreciates pizza in all its forms, and the museum is devoted to fostering that appreciation in others. There’s wall text describing the history of pizza how it has evolved through time and geography. 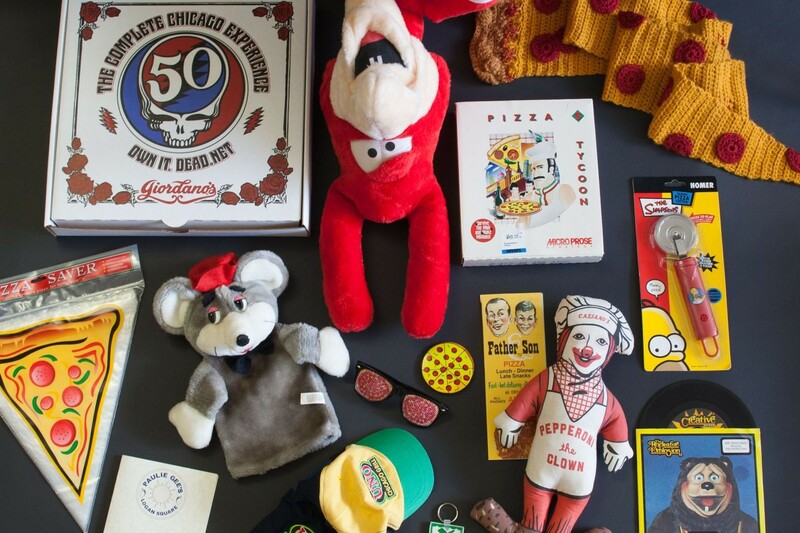 There are also plenty of representations of pizza, in photographs and in many other forms, including menus and boxes from classic pizza joints, board games, video games, children’s books, comic books, luggage tags, baseball caps, plastic figurines of the Pizza Inn mascot and the ShowBiz Pizza crew, sleeves from the Fat Boys’ first album and Lou Monte Sings Songs for Pizza Lovers, a DVD called The Original Video Pizza that promises “1 pizza-filled hour,” a protest sign that demands “Pizza not Patriarchy,” and a crocheted scarf that looks like a very long and very droopy slice of pepperoni. The whole effect can make a person very hungry. Unfortunately, there is no actual pizza. This made a woman who knocked on the front door one day before the museum's opening, attracted by the gigantic picture of a pizza in the front window, slightly cranky. “You’re a pizza museum that doesn’t have pizza?” she asks incredulously. See, a crocheted scarf that looks exactly like a slice of pepperoni! The museum doesn’t have cooking facilities, Bruns explains. The space, located in an upscale shopping mall between a Loft and a LensCrafters, was previously a clothing store. Fortunately, in addition to his enormous collection of pizza memorabilia, Bruns possesses an encyclopedic knowledge of nearby pizzerias. Soothed by Bruns’ pizza expertise and recommendations, the woman promises to come back to visit the museum after it opens. Then she disappears into the night, presumably in search of pizza. Before Bruns moved to Chicago in 2010 from Cincinnati, all he knew about Chicago pizza was deep dish. That wasn’t what had attracted him: He was more interested in the local art and music scenes. 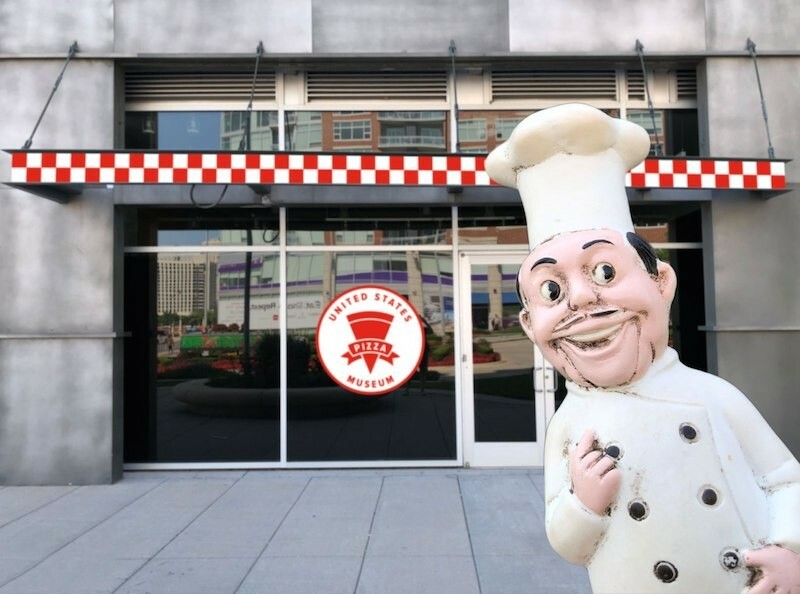 He was, however, pleased to learn that there were many other local styles as he happily explored the city’s pizza scene, too. Then in 2012, he read an article that listed the top 25 pizzerias in the country. He realized he’d only visited two or three, which was a bit shameful for a pizza aficionado. He resolved to visit more of the places on the list. He’s also a fan of national parks — his other big project has been writing acoustic songs inspired by the various parks — and was happy to have guidance of where to eat when he traveled. Also, he says, “pizza tastes better after a long day of hiking.” He decided to collect memorabilia to commemorate the pizzerias he visited. And thus it began. An artist's rendering of the new museum's entrance. In its current form, the U.S. Pizza Museum consists of three glass display cases and three display walls, plus a small gift shop that sells, among other things, T-shirts, pizza umbrellas and pool floats, and a triangular plastic pizza holder that you can wear on a lanyard around your neck. Bruns stores the remainder of his collection in a back room, and he may add more items during the museum’s run, which will last at least until October, depending on the number of visitors. Although some forms of pizza get more attention than others — New York style because it was the first on these shores, deep dish because Chicagoans feel as strongly about Uno’s and Lou Malnati’s as St. Louisans do about Imo’s — true to Bruns’ philosophy, all pizzas are treated with equal love. St. Louis pizza, for instance, “features Provel, a processed cheese blend of cheddar, Swiss, and provolone with a low melting point that gives it a gooey texture.” See, not derogatory at all!